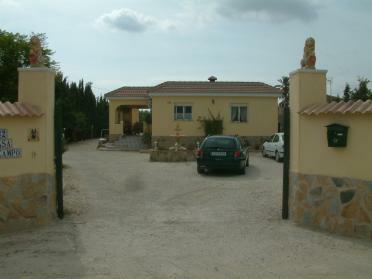 This is a lovely 5 bedroom villa situated on the outskirts of Callosa De Segura, and within easy reach to the town, schools and all motorway links to Torrevieja, Alicante, and Murcia. A family home set amongst orange and lemon groves within a small thriving community. Local fiestas are held for the residents several times a year in the nearby church, and this friendly hamlet enjoys the fruits of the countryide �La Huerta�. The plot is 2,000 m2 and the garden is landscaped and well planted to create a very low maintenance garden. There is a small fruit orchard, and a vegetable plot at the bottom of the garden. It has 2 good size storage sheds, a workshop and a dog pen with kennel at the side of the property. This well maintained home comprises of 5 bedrooms and 2 bathrooms, a very large lounge/dining room,good sized kitchen and plenty of storage. It has 2 wood burning feature fireplaces, and is well decorated throughout. The property is on mains sewage and electric, and has telephone, alarm, sat tv and air con.